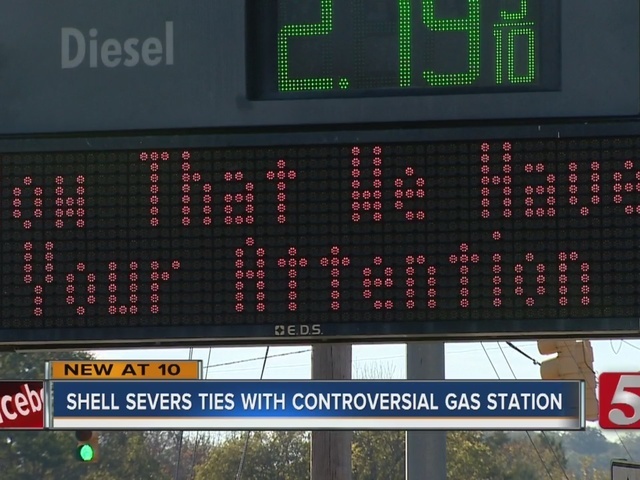 After a gas station in Tennessee received backlash from political messages, at times using expletive language, Shell pulled its branding from the station. The Lewis Country Store in Davidson County, Tennessee, has been raising eyebrows for the messages posted on its electronic sign for months. You could call what's happening now a war of words. Customers and people who drive past the Lewis Country Store read messages about Bengazi, Paul Ryan and Hillary Clinton. The sign gaining the most attention is the one that reads "Trump that b*tch." "It's not very appropriate for the side of the road," Scott Smith said. Many have used their own words to speak against the sign. Mom Jennifer Gentry saw it for the first time with children in the car. "I was horrified," she said, "it was terrible language and very hateful." But the Lewis family has always said that the words on their sign are their opinions, protected by the First Amendment, and their customers agree. "My mom, my dad has always been like 'I don't care what they put up there about Trump but they always got our business,'" said Josh Hood, who lives nearby and shops at the store on a daily basis. When Hood approached the gas tank at the store Friday he was greeted with a different sign, and a shortage of gas. A printed sign on pumps read: "Due to our refusal to remove our pro-Trump sign, Shell Oil has de-branded us. We will not be threatened or intimidated. Our doors will remain open. Vote Trump on Nov. 8th so this does not happen to you!" "I kinda expected that something like that should happen," said customer Timothy Mueller. He occasionally visits the store and knows the vulgar language on the sign makes some people uncomfortable. A Shell spokesperson confirmed that the company pulled the plug. "Independent wholesalers must adhere to branding guidelines set forth in our licensing agreements," wrote spokesperson Natalie Mazey in an email, "when there are violations, we ask that they are addressed. Continued violations could result in additional actions taken, including potential de-branding of the site. We can confirm that Lewis Country Store, located on Old Hickory Blvd and Ashland City Highway in Northwest Davidson County, is no longer part of the Shell-branded network." "I don't think they should be a gas company if they're going to de-brand somebody over their political beliefs," Hood said. Customers said while they may not agree with the signs, they support the Lewis family, including in their recent decision to sue Shell. "I've been here 22 years and it's one of the best stores around," Mueller said. So it appears this war of words may be decided in a court of law.